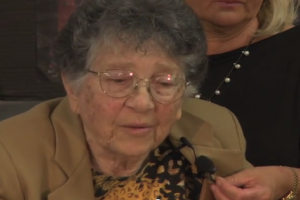 In commemoration of Yom Hashoa, Holocaust Remembrance Day observed this week, survivor Judy Simon, 90, will discuss her traumatic experiences in the most infamous Nazi death camp, and her ongoing commitment to education and justice for all. Simon’s intimate discussion will take place at 5 p.m. on Friday, April 17, in Elkins Auditorium, Malibu campus. A local resident, Simon, who is originally from Hungary, was 20 when the Germans invaded and occupied her native country. She, and her late husband Bernd, also a Holocaust survivor who later became a Nazi hunter, spoke at Pepperdine in 2013. After the war, the couple were active for many years in Pepperdine's Simon Hero Foundation, which develops and distributes an advanced, highly customized 3D “social education platform” for use in museums, schools, and universities worldwide. For more information, please contact Martin Jago, (310) 568-2828.